In previous tutorials, we showed how to visualize and manipulate time series data, and how to leverage the ARIMA method to produce forecasts from time series data. We noted how the correct parametrization of ARIMA models could be a complicated manual process that required a certain amount of time. Other statistical programming languages such a R provide automated ways to solve this issue, but those have yet to be officially ported over to Python. Fortunately, the Core Data Science team at Facebook recently published a new method called Prophet, which enables data analysts and developers alike to perform forecasting at scale in Python 3. This guide will cover how to do time series analysis on either a local desktop or a remote server. Working with large datasets can be memory intensive, so in either case, the computer will need at least 2GB of memory to perform some of the calculations in this guide. For this tutorial, we’ll be using Jupyter Notebook to work with the data. If you do not have it already, you should follow our tutorial to install and set up Jupyter Notebook for Python 3. Now that we are all set up, we can start working with the installed packages. This will open a notebook which allows us to load the required libraries. Notice how we have also defined the fivethirtyeight matplotlib style for our plots. After each code block in this tutorial, you should type ALT + ENTER to run the code and move into a new code block within your notebook. We now see that our Month column is of the correct datetime type. With our data now prepared, we are ready to use the Prophet library to produce forecasts of our time series. In this section, we will describe how to use the Prophet library to predict future values of our time series. The authors of Prophet have abstracted away many of the inherent complexities of time series forecasting and made it more intuitive for analysts and developers alike to work with time series data. To begin, we must instantiate a new Prophet object. Prophet enables us to specify a number of arguments. For example, we can specify the desired range of our uncertainty interval by setting the interval_width parameter. Now that our Prophet model has been initialized, we can call its fit method with our DataFrame as input. The model fitting should take no longer than a few seconds. In the code chunk above, we instructed Prophet to generate 36 datestamps in the future. When working with Prophet, it is important to consider the frequency of our time series. Because we are working with monthly data, we clearly specified the desired frequency of the timestamps (in this case, MS is the start of the month). Therefore, the make_future_dataframe generated 36 monthly timestamps for us. In other words, we are looking to predict future values of our time series 3 years into the future. The DataFrame of future dates is then used as input to the predict method of our fitted model. A variation in values from the output presented above is to be expected as Prophet relies on Markov chain Monte Carlo (MCMC) methods to generate its forecasts. MCMC is a stochastic process, so values will be slightly different each time. Prophet plots the observed values of our time series (the black dots), the forecasted values (blue line) and the uncertainty intervals of our forecasts (the blue shaded regions). The plot above provides interesting insights. The first plot shows that the monthly volume of airline passengers has been linearly increasing over time. The second plot highlights the fact that the weekly count of passengers peaks towards the end of the week and on Saturday, while the third plot shows that the most traffic occurs during the holiday months of July and August. 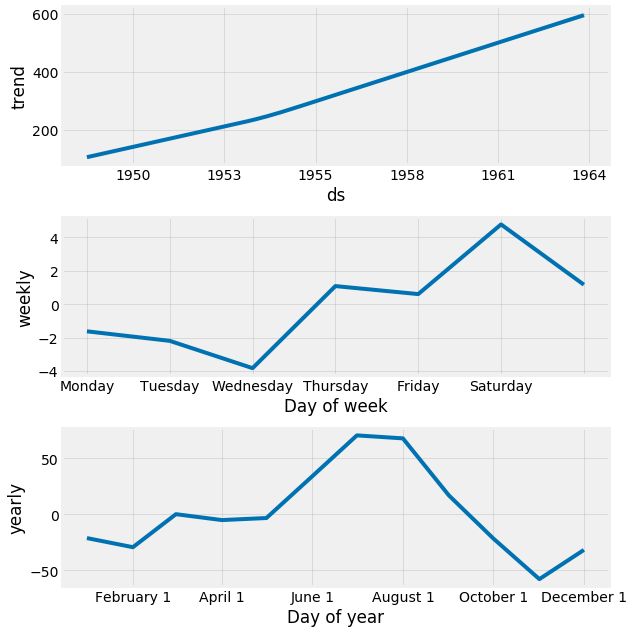 In this tutorial, we described how to use the Prophet library to perform time series forecasting in Python. We have been using out-of-the box parameters, but Prophet enables us to specify many more arguments. In particular, Prophet provides the functionality to bring your own knowledge about time series to the table. Assess the effect of holidays by including your prior knowledge on holiday months (for example, we know that the month of December is a holiday month). The official documentation on modeling holidays will be helpful. Change the range of your uncertainty intervals, or forecast further into the future. For more practice, you could also try to load another time series dataset to produce your own forecasts. Overall, Prophet offers a number of compelling features, including the opportunity to tailor the forecasting model to the requirements of the user. Time series are a pivotal component of data analysis. 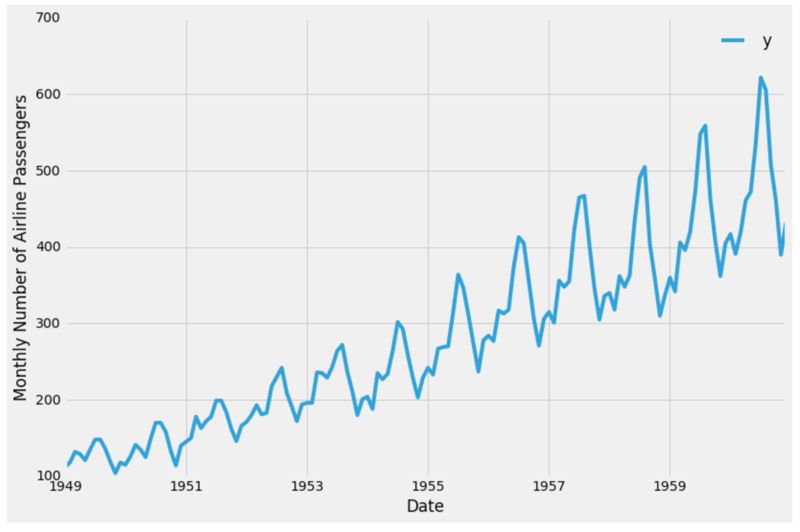 This series goes through how to handle time series visualization and forecasting in Python 3. In this tutorial, we will introduce some common techniques used in time-series analysis and walk through the iterative steps required to manipulate and visualize time-series data. In this tutorial, we will produce reliable forecasts of time series. We will begin by introducing and discussing the concepts of autocorrelation, stationarity, and seasonality, and proceed to apply one of the most commonly used method for time-series forecasting, known as ARIMA. 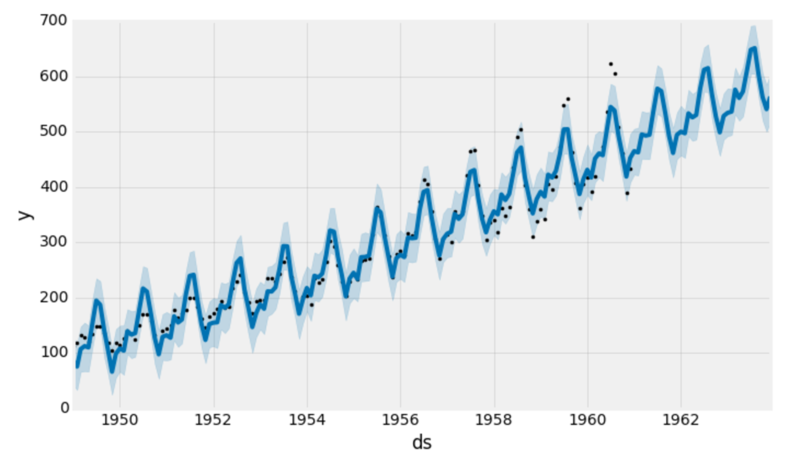 This tutorial shows how to produce time series forecasts using the Prophet library in Python 3.